Then there was the bad weather. It would come in one day when the fall was over. You would have to shut the windows in the night against the rain and the cold wind would strip the leaves from the trees in the Place Contrescarpe. The leaves lay sodden in the rain and the wind drove the rain against the big green autobus at the terminal and the Cafe des Amateurs was crowded and the windows misted over from the heat and the smoke inside. The weather turned nasty over the past several days of the holiday, with rain continuing, floods abounding in north Texas, the skies darkening and temperatures plummeting. Waking at 6:50 this morning and feeling rested, I decided to lower my thermostat to 65 degrees, pull a sweater over my denim shirt, enjoy the coffee, read and see if I could make something good of the cold, wet day. 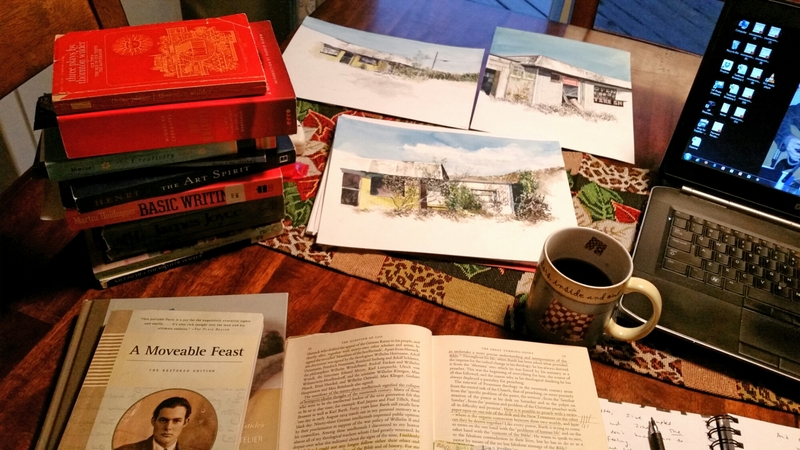 After a satisfying breakfast, I sat at my writing desk for a few hours, and enjoyed a smorgasbord of reading, from the diaries of Andy Warhol and Henry David Thoreau (quite a contrast) to some translating from my Greek New Testament. I opened Paul’s Letter to the Romans and worked over the text of the opening six verses, enjoying the language, and reading remarks from Karl Barth’s Commentary on Romans as well as the exacting work of C. E. B. Cranfield in the International Critical Commentary. After writing several pages of ideas in my journal, I then turned to my bank of digital images of fall scenes taken over the years, particulary during rainy weather. I decided to attempt a steep hill and cut-out rocky bluff between High Ridge and House Springs, Missouri, where the highway blasted through rock, cutting a swath between the towns. I had taken several pictures of this area during heavy rains over the past several autumn seasons, and decided I would give this one a try. I began by laying down a large wash of lime green and bright yellow. When it dried, I masqued as many leaves as I could over the light colors, then poured a mixture of violet, crimson and other colors over the dried masquing. Once I stripped that away, I attempted the rocky bluff below and the tree line above. I’m not getting what I want just yet, but perhaps in the days ahead I can push this painting in the direction I’m hoping. At any rate, it was a good dark, cold afternoon for being indoors painting, and it felt good to be in the studio again. Throughout this lovely Thanksgiving holiday season, I have managed to awaken every morning without an alarm and rise around 6:00. I felt every morning that the muse was stirring, and I usually responded with a watercolor attempt, followed by quality reading and writing. This morning I awoke again around 6:00 to a dark, rainy climate, and immediately sensed a Thanksgiving Hangover–no appointments today, no time to spend with friends or family, no culinary feast to enjoy, just a quiet, dark day to do as I please. I found myself in the mood to read first, then sketch later. 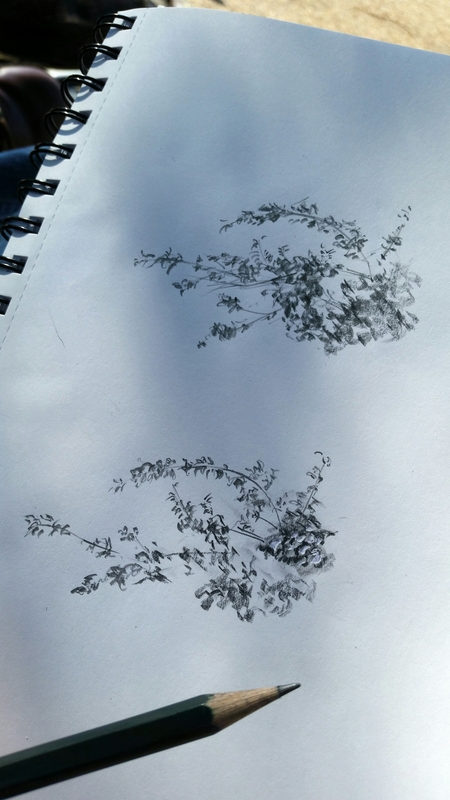 The dim morning light never did intensify, so I finally looked out the window at a tree in the neighborhood and decided to give it a try with pencil. The effort contained its own reward; I always enjoy the process of making art, regardless of the outcome. The process is always more fulfilling than the final picture viewing, for me. Once it has pleased God to speak, all theology, being human speech about God, can only be a stammering repetition, a spelling out of what God has said, a thinking over of his thoughts. 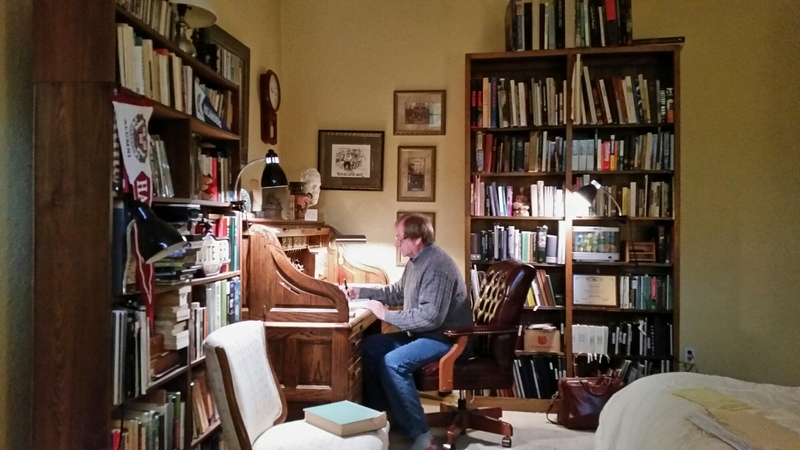 A long time ago, when I was in the pastoral ministry, I harbored these ideas as I went about the task of preparing weekly for the church pulpit. Convinced that God had spoken, I tried faithfully to reproduce in word and action the essence of the New Testament message. Today I feel similar sensations as a plein air artist–the creation before me speaks in all its grandeur, and I haltingly attempt to capture its essence on paper with pencil and watercolor. The response never reaches the heights of the primary stimulus, but boy, what a rush to participate in the task! 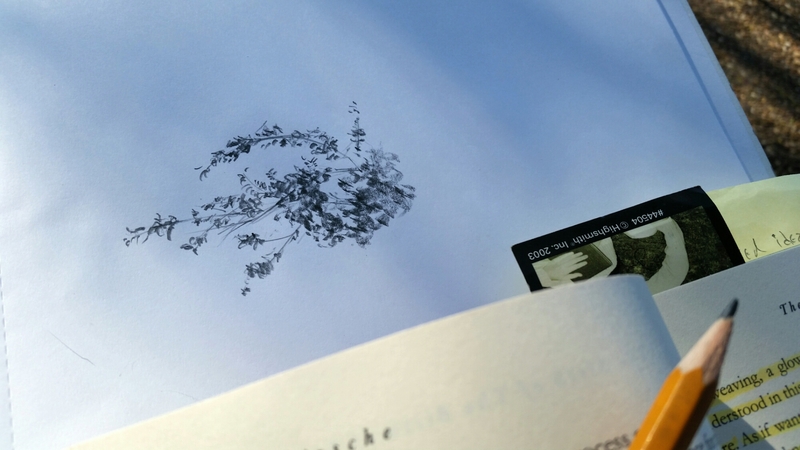 This morning has already been sublime, just from moments spent trying to record the essence of a tree in a sketchbook and writing in my journal responses from the heart to what I’m reading this morning. I make art to understand. Before I sign off for this Thanksgiving Day, I thought I would post to the blog once more, about the question of beauty. 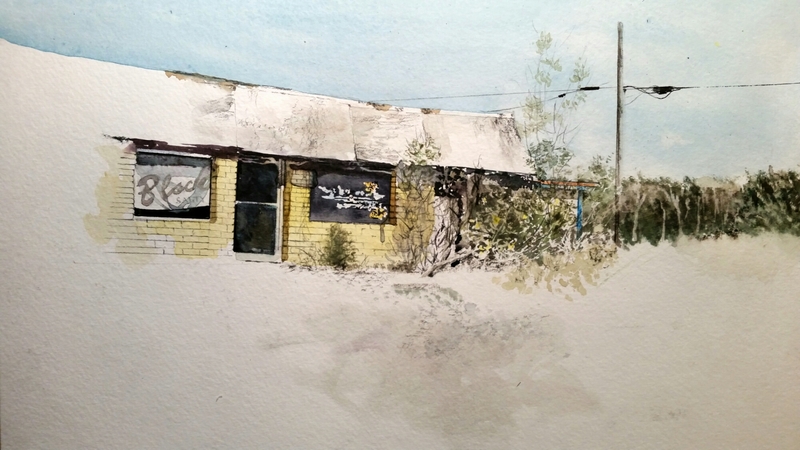 I knew while I was taking art classes in high school that I was attracted to abandoned buildings, and wondered how one could call such a subject matter for art “beautiful.” The Andrew Wyeth drybrush studies drew me in, because he was always painting ruined architectural structures in Pennsylvania and Maine. Every time I looked at his paintings, I thought of the outbuildings on my grandparents’ farms in all their ramshackle appearance. I liked the look, and still do. I think that stories ooze from the details of such buildings. This tire shop I came across in Atoka County Oklahoma arrested my attention to the point that I turned my vehicle around several miles down the highway and went back to see it and photograph it. 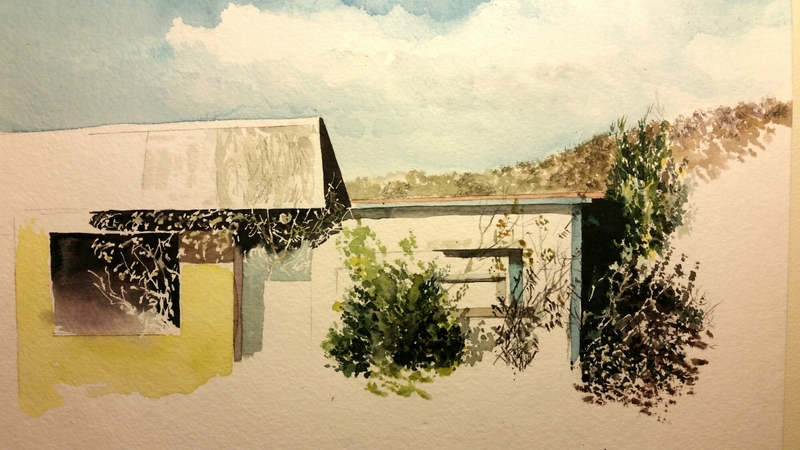 Now, leading up to this Thanksgiving Day, I have watercolor sketched the site three times, and feel that I am just now “getting into” the subject. I think it deserves some short stories, some poems, some word sketches to depict it. And it is highly possible that I will be doing something further with the subject before I return to work next Monday. 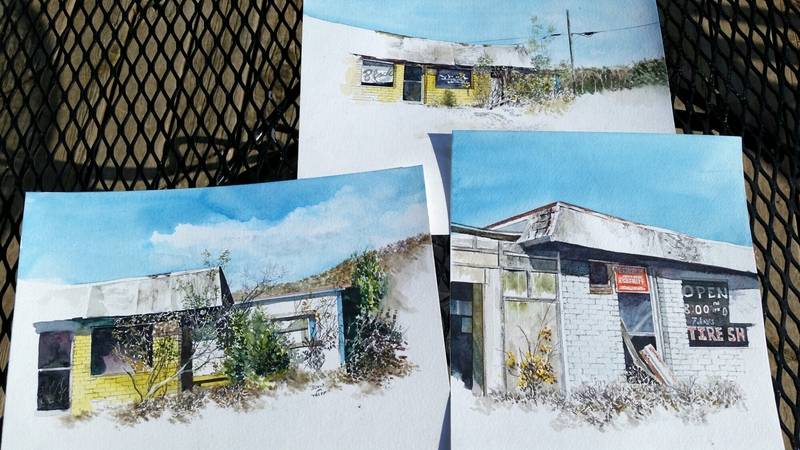 In the meantime, I am looking over these three watercolor attempts and pondering my next move. Happy Thanksgiving to anyone out there reading this. I don’t think I could have planned a better one for myself. Waking in the darkness before dawn, enjoying the warmth of covers, and thinking good thoughts, I decided the first thing I wanted to do once I got up was go back to the third watercolor I started over the past three days, and see if I could finish it. I did. I took some chances in color that I’m not used to taking, and am glad I did. I also tried out some new techniques in drybrush with the foreground–a combination of masquing, staining with a drybrush, and pencil rendering/scribbling–which was also enjoyable. Returning to a book I’ve read once all the way through and am nearly finished with my second reading, I’m amazed at the insight and clarity with which Robert Henri wrote. The man was truly a prophet, a seer, a visionary, and I’m grateful that he recorded his thoughts for posterity. He has been a real gift to me personally. I love the quote posted above. And I’m glad, in retrospect, that I returned to my artistic roots. I laid down the pencil and brush to pursue graduate studies in academic subjects, and followed a career in education. But one day I woke up and decided to return to what gives me the most deep-seated pleasure in life–making art. My job is still a good experience for me, but I live to pursue my passion when not on the job, and the activity never lets me down. The holidays have been meaningful this year because I’ve had uninterrupted time to pursue painting and thinking, and it’s all been very, very good. The object of painting a picture is not to make a picture–however unreasonable this may sound. The picture, if a picture results, is a by-product and may be useful, valuable, interesting as a sign of what has past. The object, which is back of every true work of art, is the attainment of a state of being, a state of high functioning, a more than ordinary moment of existence. With a heart of gladness, I spent my third day in a row working at watercolor. The subject is the same Atoka County, Oklahoma tire shop that I photographed on one of my road trips to Missouri. This one I did not finish, as there were too many interruptions. I’m hoping that I’ll wrap it up tomorrow, despite Thanksgiving and the welcome distractions it might offer. My heart is filled with Thanksgiving over many things, but one of them is this space, improved health and a general spirit of eudaimonia that makes it possible to paint. After all, the goal is not making art. It is living a life. Those who live their lives will leave the stuff that is really art. Art is a result. It is the trace of those who have led their lives. It is interesting to us because we read of the struggle and the degree of success the man made in his struggle to live. Thanksgiving break could not have come at a better time for me–time to rest up, get stronger from this lingering sinus infection, and devote some quality time to reading and watercoloring. Going back over my computer files, I’m glad I dug up this photo of an abandoned tire shop somewhere in Atoka County, Oklahoma. Whoever owns this wretched piece of real estate has no idea that someone drove by, turned his head, continued to think about what he saw in passing, and turned his vehicle around on the highway to return to the spot, get out and photograph it from multiple angles while nearby a pair of deer hunters dressed in camouflage smoked cigarettes and stretched their legs, walking around their parked vehicle. 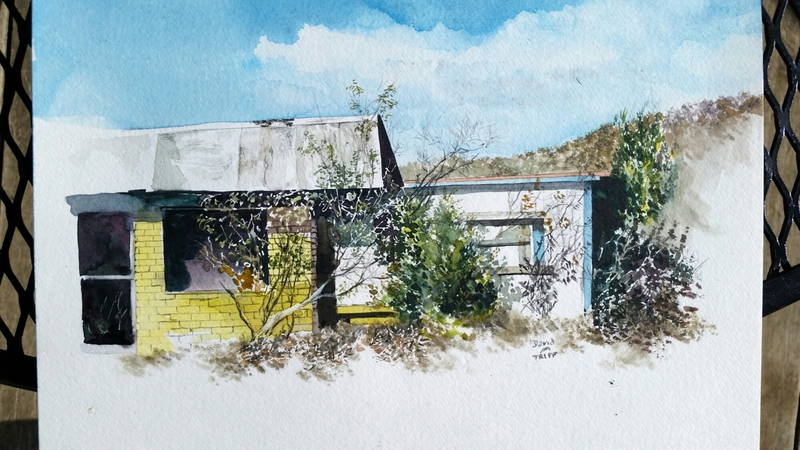 I have now completed two small watercolors of the site in two days. Maybe tomorrow I’ll tack on a third. Every square foot of this structure seems to narrate a story to me. “Do not worry. You have always written before and you will write now. All you have to do is write one true sentence. Write the truest sentence that you know.” So finally I would write one true sentence, and then go on from there. It was easy then because there was always one true sentence that you knew or had seen or had heard someone say. If I started to write elaborately, or like someone introducing or presenting something, I found that I could cut that scrollwork or ornament out and throw it away and start with the first true simple declarative sentence I had written. The most frutstrating part of being ill the past couple of weeks was the inability to use my eyes for reading, writing or making art. 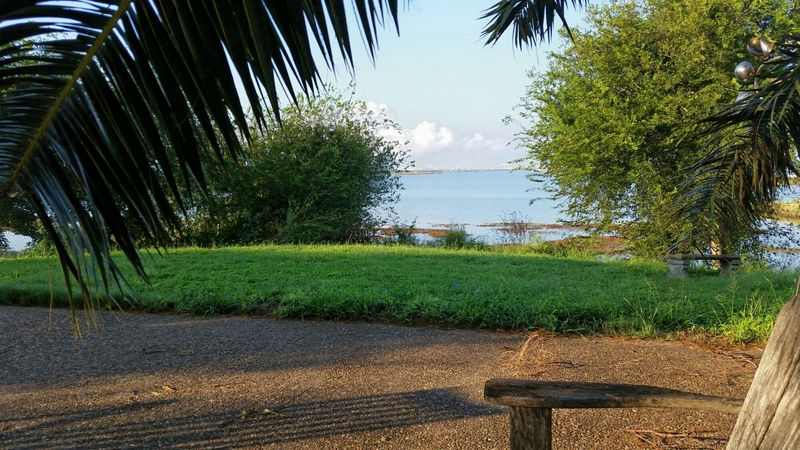 For months I had been toiling over a manusccript describing my experience painting and journaling on the Texas Laguna Madre last summer. During the struggle I took Hemingway’s words to heart, refusing to succumb to writer’s block, and refusing to think my writing was garbage. As the manuscript grew and became more unmanageable, and as the school semester became more demanding with its unceasing deadlines, I pushed the manuscript into a drawer and decided to let the ideas “compost” awhile. Then I got sick! Now I’m better, and a most wonderful gift was given to me that I shall always cherish–a rolltop desk. Designating a corner of my bedroom as my writing area, I’ve dedicated a part of every single day to sitting here and reworking the manuscript I began last June. I have always loved the writing process and now will seek a way to strike a balance between my writing and painting studios. I’m grateful that life is abundant enough to support both endeavors. I am not interested in art as a means of making a living, but I am interested in art as a means of living a life. It is the most important of all studies, and all studies are tributary to it. After nearly two weaks of a nasty sinus infection and demanding school schedule, I am delighted to emerge intact, and most grateful for this opportunity to pick up the brush again! When I feel sick to the point that I cannot use my eyes, life is so bleak, and the past two weeks without art and reading were dismal. On a recent road trip, I experienced a moment described about our famous painter Edward Hopper–it was often said that he would pass by a subject worthy of painting, and, a few miles later, would turn his car around and go back to the location, so powerful was the lingering mental image of the subject. This happened to me. An abandoned tire shop alongside a quiet highway arrested my attention, and I drove a good five miles before turning around to get back to it and take some pictures–I felt that the structure just bristled with stories. Photographing it from a multiple of angles, and so grateful for the bright sunlight, strong shadows, and cold bracing weather, I determined that I would begin studies of this as soon as I felt sound in mind and body again. The holidays are approaching, and I decided not to wait until Thanksgiving to get out the watercolor supplies. This is a small study–approximately 8 x 10″ in size, but I kicked it out in half a day today and am itching to begin another. It feels splendid to be sketching again. I have worked exclusively in Texas coastal subjects since my artist-in-residency last summer. I’m glad to return to this nostalgic strain once again–it’s been awhile. As the morning temperatures hold steady and cool, greeting November, I’m gratified to be seated outdoors, gazing at trees and drawing with pencil. Sketching sets my mind free, allowing me to sort out my reading over the weekend. At the same time, my eye delights in the natural designs woven through these tree branches next door. Nietzsche concluded that the current lack of myths consigns modern man to deracination. Modern people seek to anchor themselves with possessions, technology, science, and the archives of history. Getting that extra hour of sleep worked magic on this morning! Driving eight hours to Corpus Christi on a Friday after school generally leaves me low on energy the next day. Retiring early to bed last night resulted in waking at seven this morning to a beautiful view of the bay. With coffee, I opened this biography on Nietzsche to the chapter discussing his views on art, and I am always delighted to read others’ thoughts on beauty. And what I read made me happier than ever not to be bogged down with business this day. In a few hours I will pick up my load of 22 framed watercolors to take back home with me as my show here in Corpus Christi closes. But for now, I’m delighting in the quiet solitude of my gracious hosts’ back deck, and combining some excellent reading with pencil sketching of the trees in this back yard. I make art as I relax.